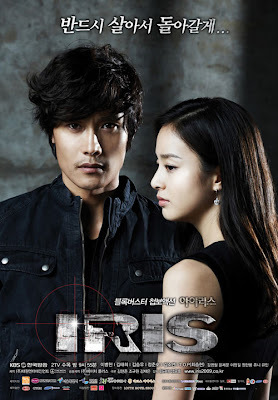 With a happy conclusion to My Fair Lady last night, KBS2TV will finally be airing their spy action thriller drama, IRIS after months of hype and anticipation. 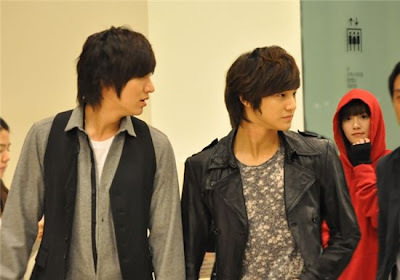 In case you didn't know, the drama boasts of a stellar cast which includes Jung Jun Ho, Kim Tae Hee, Lee Byung Hun, Kim So Yeon, Kim Seung Woo, and T.O.P. In this new IRIS couple poster version, Lee Byung Hun is seen looking straight ahead with a determined look, while Kim Tae Hee looks away with sorrow etched all over her face, hinting at their obstacle laden destiny, invoking curiousity from fans. According to a production staff, even though Lee Byung Hun and Kim Tae Hee are working together for the first time, they have showed great chemistry together. As her senior, Lee Byung Hun has also been very dedicated in teaching Kim Tae Hee on how to approach her role, from actions to expressions. IRIS comprising of 20 episodes, will air on 14th October.